It’s the holiday season, that magical time of year when Canadians come together to ask: Why are we still paying more for everything than Americans? Amazon launched its Canadian Kindle store a few weeks ago, and it took little time before consumers began to notice, much to their chagrin, that e-book prices in the Canadian store were consistently higher than they were in the U.S. online store. It was just the latest annoying chapter in the long-running saga of Canadians paying higher prices than Americans for just about everything. It’s been five years since the loonie first came within parity range of the U.S. dollar, and we still have price gaps of up to 40 per cent on some items. But with e-books the price differential seemed especially unjustified: There are no physical books to be shipped to small Canadian bookstores thousands of kilometres from the nearest distribution centre, no import tariffs or higher rental rates on store locations to be paid. E-books are just data, in many cases less actual bits of data than the page you’re reading right now. We called Amazon Canada and the Canadian Booksellers’ Association, and they both said the same thing: Talk to the publishers, they set prices for books. So we called a few publishers. We’re still waiting to hear back from them, but in the meantime Karen Proud at the Retail Council of Canada did offer some interesting — and perhaps depressing — insight as to why prices would be higher in Canada than in the U.S., even for something like an e-book, and why things may not change even after years of loonie-greenback parity. It’s called “country pricing” — the practice by some manufacturers and brand owners of charging different prices in different countries for otherwise identical items. In our case, Proud said, they do it because they believe Canadians will pay a higher price. “It’s a huge area of contention for our members,” she said, referring to the thousands of retailers who are part of the Retail Council. Mark Lefebvre, president of the Canadian Booksellers Association, had a similar take. He said publishers have it “entrenched” in their minds that Canada is a higher price market. 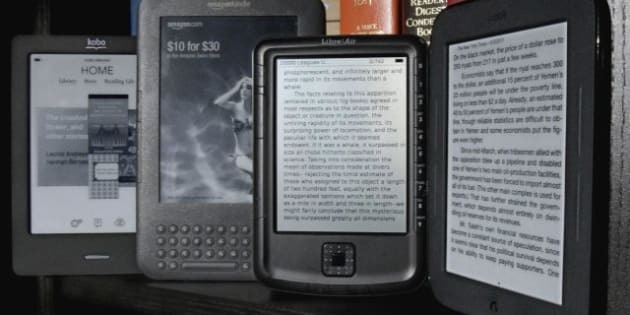 “It’s ingrained in everybody’s head that things are always more expensive in Canada,” he said, adding that he can see “no logistical reason” for higher e-book prices north of the border. But Lefebvre points out that not all publishers charge more in Canada than in the U.S. In fact, many small Canadian publishing houses charge the same here as south of the border — and sometimes even less. Lefebvre pointed out ECW Press and Edge Publishing as two houses that charge the same prices here and in the U.S. In fact, Clockwork Angels, a novel tie-in with the Rush album of the same name, published by ECW, costs $15.99 in Canada — and $16.18 in the U.S. That’s a 19-cent discount for being Canadian — not all that much, but hey, it’s something. Publishers like this, who treat their readers “with respect … should be applauded loudly and proudly,” says Lefebvre, who admittedly has a personal stake in supporting indie publishers — he’s been published by a few of them, including Edge. Jim Saunders, a consultant at market research firm Pricing Solutions, says the price gap ultimately is about “willingness to pay,” and sellers simply believe Canadians will pay what they charge. He suggests that Canada’s “larger and more affluent middle class” makes it easier for manufacturers to charge more. But from his experience as a pricing consultant, Saunders also found there is a different culture among Canadian retailers than there is among American ones. U.S. retail culture “seems to be much more about winning” than Canadian retail culture. Saunders finds American retailers are generally quicker to drop prices when competition appears. And Canadian consumers are also different, Saunders told HuffPost. Canadians don’t shop as “aggressively” as Americans, and aren’t as quick to seek out deals. So Canadian retailers and consumers are failing to put the sort of pressure on manufacturers needed to bring prices down. The whole issue is now being given some sober second thought in the Senate, where hearings began this fall on the causes of the price gap. Finance Minister Jim Flaherty told the Senate Canadians are “rightly annoyed and perplexed” at the fact that the higher loonie hasn’t translated into lower prices. Flaherty focused on import tariffs as one cause of the price gap. That’s something that also concerns the Retail Council. The organization’s Karen Proud told HuffPost that there are import tariffs in Canada on goods that are barely produced in the country anymore, such as shoes. But Saunders argues change will come when consumers put pressure on sellers to lower their prices — or when new retailers enter the market, as will be the case this spring when Target comes to Canada. “When they feel they’re being outmaneuvered, they’ll respond quickly,” he said of retailers. But if Saunders’ take on the situation is accurate, then Canadian shoppers have the opportunity to be the agents of change in closing the price gap. And one thing Canadians could do this season (other than the usual cross-border shopping routine) is to buy a book from a Canadian indie publisher. You might get a better price for it than any American could.